History buffs can easily get an education alongside Western highways. Interpretive signs point out where Chief Joseph retreated, and where Lewis and Clark spent the winter. But what if you want to know what’s coming out of the smokestack in the distance? Or what gets made inside that gigantic steel structure you just passed? The state historical societies may not tell you, but Brian Hayes will be thrilled you asked. 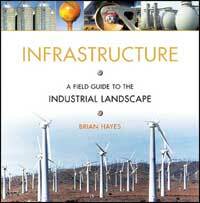 Infrastructure: A Field Guide to the Industrial Landscape is a wonderfully conversational explanation of "everything that isn’t nature," as Hayes writes. Following a rough arc from production to disposal, Hayes begins by decoding the visible signs of mining, waterworks and agriculture, then moves on to the energy grid, communications, transportation, and waste and recycling. With gentle enthusiasm and oddly beautiful photographs, Hayes shows us how the modern world really works, and the view is unexpectedly fascinating. Even technophobes may find themselves intrigued by the intricacies of highway overpasses, substation capacitors and wind turbines. Hayes, a senior writer for American Scientist, spent more than fifteen years photographing and writing Infrastructure, and the effort has clearly paid off. The only problem with this tome is its coffee-table size: It’s so informative, and so strangely addictive, that one wishes for a pocket edition for road trips. Hayes takes no moral stand on the human transformations of the natural landscape, proposing only to shed light on "all the miscellaneous hardware that goes into making a civilization." But in illuminating humanity’s hardware, Hayes encourages his readers to look more closely at both the unnatural and natural landscape. In the process, he also manages to renew our sense of wonder: Who knew there was so much inspiration in a pile of concrete?